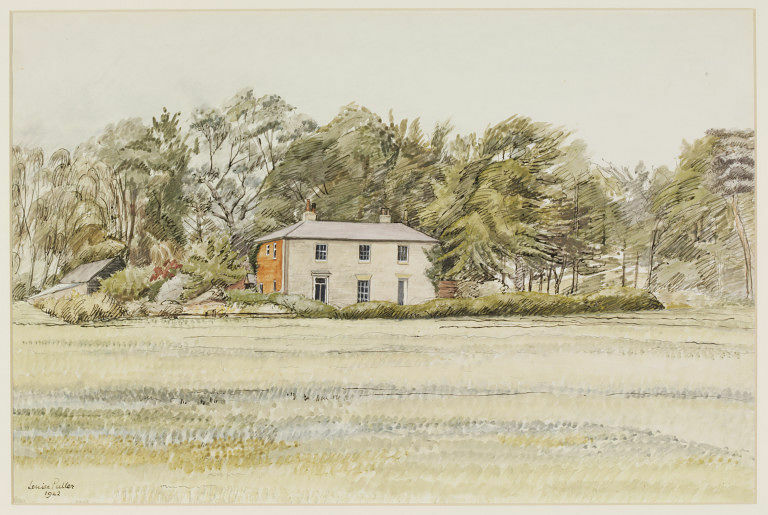 This Georgian farmhouse is one of five farmhouses in the environs of Sudbourne, Suffolk depicted by Louisa Puller for the Recording Britain scheme. Some of Puller's farm watercolours reference the present by including signs of technological progress (usually telephone wires). However, this farmhouse nestled among fir trees projects an air of timelessness. 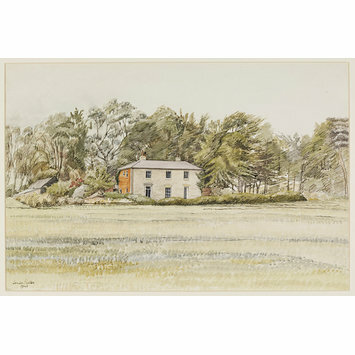 A watercolour drawing of a Georgian farmhouse seen from across a field, surrounded by tall fir trees. This is one of six views of farms near Sudbourne painted by Louisa Puller for the Recording Britain project. Watercolour, 'The Firs (Farmhouse) near Sudbourne', by Louisa Puller. Recording Britain, Suffolk.